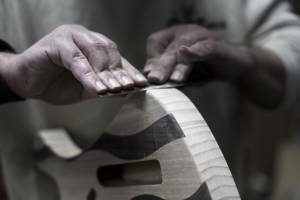 We manufacture handmade low and guitars by order. Electric guitars and Basses: solid, open and with cameras. Acustic and acoustic-electric guitars and guitars. We work with the best materials and the best brands of hardware available in the market.We have exotic domestic timber and import in its optimal degree of moisture and healing. We manufacture handmade low and guitars by order. Solid, open and with cameras. Acustic and acoustic-electric guitars and guitars. We design the instrument you need, the one you are looking for or imagine. With our advice and according to your specifications.